As blood spilled over the edge of the knife and the gurgling subsided to a murmur, the figure slowly guided their victim to the floor. It was messy, but it was quiet. The figure stood to examine their handiwork and couldn't help but grin slightly. They didn't mind a bit of blood. In fact, it was only going to get messier. A few minutes later, the figure stepped away from the body and disappeared back into the shadows. Mittelmarch would hear this message, loud and clear. OOC: Please forgive the "Invite Only" restriction. It is not our intention to keep people out of the story, but those of us who are working on it are trying to set things up and move the story a certain direction. For now, please just hang in there, and before too long we will let you all know when you can jump in. Hope you enjoy what we have planned. A few hours after dawn Carneth woke up and made his way to Cedric’s. This part of the city was usually pretty quiet until the evening, which made for peaceful work. It was certainly out of place to run into a crowd. Carneth made his way through the throng, sometimes physically moving people in order to get through. Working at Cedric’s had come with its benefits: after helping Jed and Zigler throw out drunks for the past year, no one seemed too eager to pick a fight with the stocky dwarf. Other than a few disgruntled looks, he passed through without incident. The scene he encountered had recently become all too familiar. The corpse’s throat had been brutally slashed open, soaking the victim’s tunic with blood. It was an elf this time, and Carneth recognized him as a merchant: successful, but certainly no threat to anyone. What had he done to warrant such a gruesome death? It was not lost upon the dwarf that the victim was not a human. The others hadn’t been, either. “Which means you don’t know anything,” the balding man said derisively. The man stormed off, scowling. Carneth glared at the man’s retreating back, but he couldn’t really blame him. The dwarf took one last look at the message written on the wall, though he knew what it would say. Like all the others, it was written in the victim’s now-drying blood. The murder weighing heavily on his mind, Carneth let himself into Cedric’s and started cleaning up. The day passed uneventfully and when Jed showed up to take over he excused himself. Carneth had learned a long time ago that Dorian didn’t like being bothered early in the day. The man had his quirks, but everyone had to admit the man made up for it in other ways. Besides, he had won quite a bit of respect for finishing off Shatar the year before. Dorian turned up at the alchemist’s shop, and Carneth wasted no time in describing the scene he had found that morning. “Tha’ was the third one,” he explained. “Died the same way, with the same writin’ on the wall. This ain’ chance, someone’s killin’ non-humans.” Dorian nodded in agreement. “So wha’ do we do?” the dwarf asked. Dorian had been perusing the various ingredients in the apothecary, being sure to take note of any materials he could end up using in an experimental poison he'd had in mind. With most shops, he could usually pocket a few of the wares on display without detection; unfortunately the apothecary herself knew the type of customer she usually drew in a little too well, and Dorian kept his hands withdrawn. Carneth blustered in through the door, a concerned look on his face, and Dorian could already tell what was on his mind. He could only hold up his hand in defense against the onslaught of old information and conjecture. "So wha' do we do? ", the dwarf asked. Dorian pondered for a moment. "This isn't the work of any sort of professional assassin. It's too sloppy. The message left behind has it's obvious politics, but it's more likely the actions of a lunatic or fanatical murderer, rather than a politically-sanctioned movement." He sighed quietly to himself. "And it would appear that the City Guard has no leads on the case. Not surprising, given our assumption of the suspect. Unfortunately, we need someone with more clout than either of us to be sure that this is receiving the attention the case requires." He looked inquisitively at the dwarf. Carneth took a second to decipher the man's words. The dwarf wasn't stupid, but it sometimes took him a minute to sort through Dorian's complicated speech. "So ye're sayin' it might not be the Jovians?" he asked. Dorian nodded, but seemed unsure. Still, the reasoning made sense to Carneth; there wasn't enough discipline for it to be one the highly trained assassins of the Jovian army. The dwarf filed it away for later consideration. They just didn't have enough information at this point. "Well, I'm thinkin' I might head over an' talk to Sir Nichtmar," Carneth announced. "If anyone can get some answers, it's the ogre. Anythin' else ye think we can do?" Dorian turned away, thinking to himself. "Sir Nichtmar would be a good idea. I'm not sure how much he already knows about this, but I can assume that the City Watch wouldn't mind a little help from Jovian War veterans. We've dealt with them before." Dorian began making his purchases and tucking them away within his cloak. "I know you're busy at Cedric's nearly every night, so I can keep watch at that time in your stead. I'm usually up at the hour anyway. See what Nichtmar knows and what the Crown is doing about it, and we'll work from there. Keep in touch and I'll do the same." With that, the two exited the shop and went their separate ways, uneasy thoughts on both their minds. Brom is talking to witnesses and he looks to Nichtmar and shakes his head. Once again nobody saw anything. Baethor looks over the scene of the crime sullenly, his normally stone features clenching into a dim simmering anger. He felt no love for orcs, per his dwarven upbringing, but this...These were good people...the father worked around the city, doing odd jobs to support his family... Baethor tugs on his cloak to fight away the morning chill. "Dam...thats six then ogre. I think its time for us to set a curfew, warn people to stay inside after dark..."
The dwarf finds that he cannot tear himself away from the vicious scene. Though he's been in wars, he's seen men die before...but this...the female and the youngling as well...Its a cowards game this murderer plays. "This is bad nichtmar...six murders, no clues, no witnesses. We need to get this under control, can we spare more men for night watches?" "We'll have to. A fight broke out last night, some humans got accused of being Jovian spies. We could have a riot on our hands if we aren't carefull." "Just what the city needs, another war...I dont like this nichtmar...it reeks of treachery..."
Baethor moves out of the alley and pulls his tobacco pouch from his belt and packs his dwarven pipe, he plucks a coal from a fading nearby torch and places it on the top and begins to puff away. "What about that jovian assassin who captured Isen? I thought we killed him and his men." "We slaughtered many of his men, but R'tiir was never found. There's rumors of Jovian remnant somewhere out East, but no one knows where exactly. They could be looking for some revenge. Could be any one of our enemies trying to cause trouble..."
Nichtmar stops for a second, "What was it that you saw in the Jovians? I know that Thrawn hated our kind, but Shatar he seemed to not care of race." The dwarfs shoulders square and sink, he does get tired of being reminded he was a jovian for a time, but he knows nichtmar means nothing by it. "Nichtmar. Had i a choice that day to save mittelmarch, even at the cost of my own life, i'd have taken it. But they offered something that no other enemy of mittelmarch had, a truce. I saw a path which would keep mittelmarch from being burned to the ground and all members within slaughtered, and i took it. Shatar was reasonable enough, he saw advantages in our races that his men would never be able to reach. Find me a human who can take the blows i've taken without dieing, or who can knock out a horse with a punch like you, and i'll show you a human who's made a pact with a demon..."
The dwarf chortled to himself as he drew in another puff of smoke. After leaving Dorian, Carneth first checked in on Jed at Cedric's, then made his way along the streets asking for Sir Nichtmar. After a few unsuccessful leads, the dwarf ran into a guardsman who directed him to Settler Way. He found the ogre knight with Baethor at the mouth of an alley, talking quietly. Sensing the mood, Carneth avoided interrupting the two warriors and took stock of the environment instead. It didn't take long for him to get up to speed. His knuckles turned white in an attempt to stop himself from shaking, but he eventually turned away from the carnage. At a lull in the conversation, Carneth made his presence known. He nodded respectfully before saying "I wish I could say it was good to be seein' the both of ye here, but well..." he trailed off, motioning to the scene behind him. He locked eyes with the ogre "What do we know?" and in more hushed tones, "What's Lord Gron doin'?" "Carneth..." He grabs his arm and pats his back. Looking back as the bodies are being taken away. "Well...either it's Jovian remnant or it's someone who wants us to think that. Either way it's cause trouble within our walls." "Lord Gron has gone for training. It's up to us." As he clasped arms with Nichtmar, Carneth reflected on this strange turn of events. The dwarf never would have imagined forming such a friendship, and yet here he was. The ogre knight had proved to be a worthy companion over and over. "Well, it looks like wha' we're needin' firs' then is t' know more. I talked t' a lot o' people today, but the only thin' no one claimed t' know was who did it." He looked to Baethor, and then Nichtmar. "Do either of ye have anyone ye can think of t' ask?" A name came to Nichtmar, one notorious with underground crime. He didn't want to suggest it, but what choose did he have. "Oof...with his blanket of thieves and crooks throughout the land, surely he knows something. The Problem is finding him, for a giant he knows how to disappear." Puffing stoically on his pipe the dwarf grumbled at the mention of the giants name. "I hate to say it, but, Oof is probably our bes' choice...Course he's also a likely culprit in my mind. His theives guild has been known ta slit a few throats if it served their master well...And Oof hates humans. I would nay put it past him, anyways...But if we find him i'm goin wit ya nichtmar...I still don't trust that Lout further'n i could throw him..."
Oof. Carneth knew the name of course, but hadn't had much experience with the Hill Giant in person. Still, everyone knew the head of the Thieves Guild was a force to be reckoned with. Carneth looked sideways at Brom, who shrugged. He didn't seem to have any better ideas. Pragmatic as he was, Carneth still hesitated a second before saying: "Bah, It's as good a plan as the nex'. How do we find the giant? When can we meet 'im?" He notices the lady. "Follow me, gentlemen." Nichtmar, the two dwarves, and Brom start heading down the alley after the woman. "Pardon me, miss. Do you know where I might a giant friend?" The woman smiles. "Friend sir? me thinks ye give 'im more credit than 'e deserves"
"Intrest ye in a few apples Sir knight? 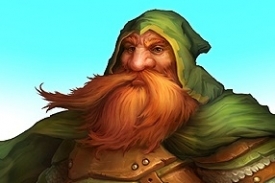 Or perhap's the dwarven Masters would like a bit o' the old Tilman?" His patience a bit thin, "No thanks Ma'am, we're looking for Oof. Can you please take us too him? She sniffs at Nichtmar, and looks over at Baethor and Carneth. "so how about it good sirs? a spot o' Ol' Tilman fer just a few silvers?" Baethor chuckles as he guesses the game. Nothing is free from thieves. Reaching into his cloak he rummages around and produces dark blue sapphire, nearly the size of a grape. "Oh my, seems all i have on me is this bauble...No no, wouldn't do to just give it up fer a few pints of beer...Its to bad you seem to not know where our large friend is, that information may be worth this little one." The dwarf lifts the gem appraisingly, letting the morning light ignite the sparkle inside of it. Then he shrugs and perhaps slower then usual he moves to hide it back away somewhere in his cloak. "Now master Dwarf what kind o' merchant do ye take me fer? you tink i can't up my price when the situation calls fer it?" "Now as far as where a certain individual is, I cannot say with any certainty, but I thought I seen a plume of smoke from the east of the city earlier this mornin in the greatwood. One o' my suppliers told me there was a meetin' there a' sundown. Said there might be as many as four people sharin some roast or somethin." "I'm not a bettin' girl good sirs but if'n I was I'd say the smoke was commin from the north o' the trail to the black gate about 15 miles outside the city. Look fer this sign, on one o' th' trees"
Nichtmar realized that perhaps Baethor may be better at this..."Dueling with words" he thought was a good name for what he just witnessed. Nichtmar always preferred a more direct conversation. All these years here he's learned history, to read and write, but still hasn't figured out this saying something, but having it mean something else. "Negotiating" they call it. He figures he'll leave that up to the dwarf next time. The group headed out to hopefully meet Oof.